Many a times, companies ask questions such as, “Should I use paid, owned or earned media for my digital marketing efforts?” and “Which is the best channel to use for my business?” Paid, owned and earned media contribute to a digital marketing strategy in different ways, but one thing is for certain – a balanced digital marketing mix is important. An understanding of these different types of media is important for the success of your digital marketing strategy. Paid media is a channel in which you pay to display your promotional content. Examples include advertising on third-party sites, Google Adwords, sponsorships, Pay-Per-Click campaigns and Search Engine Optimization Marketing. A well-crafted plan with compelling customer benefits is required in order to motivate customers to click-through your ads in this strategy. It is also important to remember to facilitate regular interactions with your customers once they express initial interest by clicking on your ads. Owned media is a channel that includes content that your business creates and manages in order to foster brand awareness. This includes your blog, your company’s social media pages, and your website. Content including blog posts, social media posts, and downloadable eBooks / white papers that are posted on these platforms can build brand awareness and potentially generate leads for your company. However, self-serving, promotional content can sometime come off as too technical, so it is important to constantly evaluate the content you produce and make sure it is thought-provoking and engaging. As such, strong social media and content marketing strategies are essential in order for your owned media to be effective and have its desired impact. Earned media is dependent on customer engagement. Converting consumers to brand advocates and influencers creates this channel where content can be distributed to a wider audience. Earned media is another way to describe online word-of-mouth marketing. With earned media, this is where customer engagement hits its peak. In the past, digital marketing used to mainly be comprised of paid media. However, consumers are tired of the bombardment of advertisements. They are now looking to build relationships with trusted brands and be more involved with them. As such, marketers have gravitated towards utilizing content marketing and earned media on a greater scale. In today’s digital landscape, a single strategy no longer works; digital marketing now requires a well-balanced marketing mix. Earned, owned and paid media should complement each other rather than being utilized independently in order to have a successful digital marketing strategy. Owned Media: Firstly, your business can create and publish content that is engaging and customer-oriented through owned media. Paid media: Your content can achieve a wider reach to prospective consumers and your target audience by placing ads through paid campaigns. 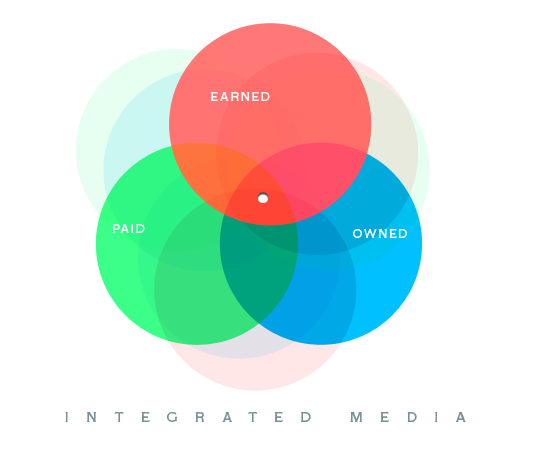 Earned media: Now, you will earn your audience’s support and trust with the content you created and distributed. This will ultimately convert them into advocates for your brand who will then help distribute your content and positive word-of-mouth to their broader networks.